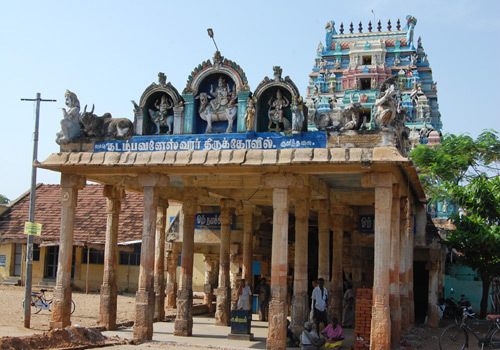 The shrine is praised in the hymns of Saints Tirunavukkarasar and Arunagiriar. Saint Tirunavukkarasar adivises his own heart to remember the Lord of Kadamba Vanam where He appears with His blue scar in the neck – Neelakanda- as the very Four Vedas and its six Angas and worshipped by those in the celestial world. 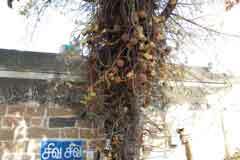 This is the 65th shrine on the southern bank of Cauvery and mentioned in Thevaram hymns. 13 day Masi Brahmmotsavam in February-March, Thai Poosam in January-February, Vaikasi Visakam in May-June, Aaipasi Skanda Sashti in October-November and Panguni Uthiram in March-April are the festivals in the temple. 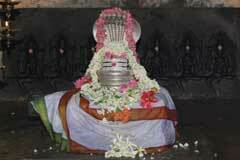 Lord Shiva graces in the temple as a Swayambu Linga facing north. Seven Virgins (Saptha Kannikas) are worshipping Him from behind. 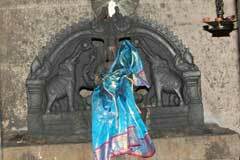 The temple is open from 6.00 a.m. to 1.00 p.m. and from 5.00 p.m. to 9.00 p.m.
Sri Kadamba Vaneswarar temple, Kulithalai-639 104. Karur district. Devotees perform wedding festival to Mother and Lord. with multiple profits including the one of worshipping the Lord in Kasi in north. The place also has the reputation of being called Dakshina Kasi – Kasi of South. 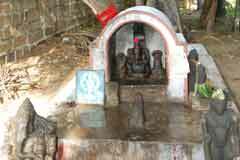 Mother Muttrila Mulai Ammai graces from a shrine facing east. 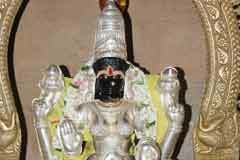 Paramanathar is the guardian deity of this shrine with his hand on the forehead in a saluting form. People perform abishek to Paramanathar with honey and offer porridge made of Pasi corn, praying Him to be a guardian of their houses too. 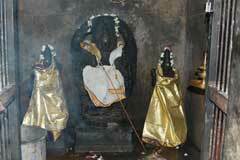 Lord Muruga worshipped Lord Shiva here for washing off the sin caused by killing of demon Surapanma. 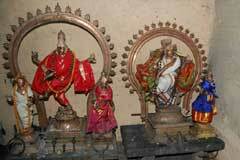 He graces from a shrine in the prakara with His consorts Valli and Deivanai with His six faces, described by Saint Arunagiriar as Lord of six military camps attributed to Him. 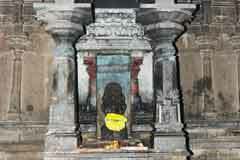 Lord Lingodhbava is on the Sanctum Koshta-wall around the shrine. 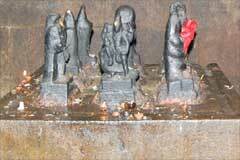 There are two Natarajas with Muyalagan under one and one without. Crescent moon shines on the head. Kulithalai is 35 km far from Karur. The temple is too near the bus stand. Hotel Arati: +91-04324-236 122, 33, 44.